Are you always interested in building something new? If most of your new projects include woodwork, probably going to need a well-built table saw. Or maybe you’re in the business of building things and could use a reliable tool that you will be able to use for years to come. Whatever the case, we’ve got you covered. We rolled up our sleeves and put the research in, coming up with the best available portable table saws for you. Take a look! The DeWalt DW745 Portable Table Saw makes clean, square cuts and has enough power to cut any stock you push through it. Take this to the next job or keep it in your shed for those DIY projects that seem to never end. It’s tough, easy to store and a breeze to transport. Best of all is the rip fence – there’s no other fence like it! That’s why it’s a top choice for portable table saws. The fence is critical to making square cuts. If a fence wiggles or won’t line up perfectly square with the blade then you’ll be constantly frustrated when trying to build cabinets, drawers or anything else that needs nice straight cuts to go together properly. A table saw needs at least a 15-amp motor to cut through hardwood stock, like walnut, so make sure that you choose a saw with that much amperage if you’re going to cut more than just fir. Not to state the obvious, but portable table saws are small. A saw with a table that can extend out to hold a sheet of plywood can be invaluable. Look for saws that have extendable tables if you plan on ripping plywood at all and you’ll be glad you did! Most portable table saws only accept 10” blades and that’s fine for almost any job; however, you may want to use a dado blade. If you’re not sure then you probably don’t need a dado blade to cut large grooves in the wood, like “notches” for shelves, but if you will need one, be sure that the saw can accept them. Rack and pinion fence is always square to the blade. It locks in place easily with a small handle underneath the saw and the fence moves very smoothly on the rack and pinion. It also telescopes out to 24” so that you can rip a sheet of plywood in half, and then back in tightly for compact storage. Adjustable rear legs let you keep the saw level on uneven surfaces. This feature comes in handy on rough, uneven ground, like jobsites or rural yards. The fence also holds a push-stick, which is extremely handy because it’s always within reach and it locks solidly into place so it won’t fall out during travel. The legs fold up easily and the wheels are strong and durable. This saw is a bit on the heavy side compared to some others. It cannot accept dado blades. The miter gauge is stored under the table and not easily accessed. Overall, this saw is a top performer and well-priced at under $330! DeWalt has obviously consulted with contractors and listened to their customers. It can travel, cut and keep you building for years to come. 25” rip capability allows it to handle a sheet of plywood with ease. By allowing the table to extend out, instead of just the rip fence, it provides extra support when cutting large sheets. The Squarelock rip fence has the ease of one-hand use. It locks tightly in place and never moves once it’s locked down. The Gravity-Rise collapsible stand is really easy to use! Some stands can be difficult to set up or takedown, but Bosch engineers solved that problem with this unique and functional stand that can be set at different. The miter gauge stores on the outside of the base, allowing for easy access. This little feature is a big plus when you’re under the gun to get a project done! Over time, the fence rails can get “gunked” up and make it hard to slide the fence smoothly, so it has to be kept clean. This Bosch is a great performer with plenty of power. 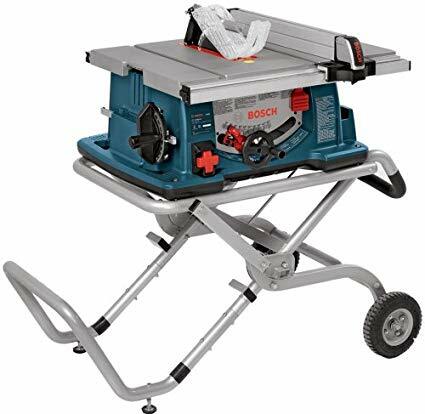 The $550 price point is a little higher than some of the other saws, but you get that great Bosch engineering and years of reliable service. The powerful 15-amp motor burns at 4,800 rpm. The rip fence is smooth and guided. The Makita can accommodate up to a 6 x 13/16 inch dado blade. The table extends to allow for ripping sheets of 4-foot stock. The two anti-kickback pawls are independent and the riving knife/spreader allows for quick and safe cuts. The riving knife/spreader also has three settings for through-cuts, non-through cuts and dado. The Makita has a lot of speed but lacks the torque of some other portable table saws. This can make it difficult to cut through very hard stock, like hickory. The rip fence relies on guides that are built into the table-top so they can become dirty, making it more difficult to slide the fence. 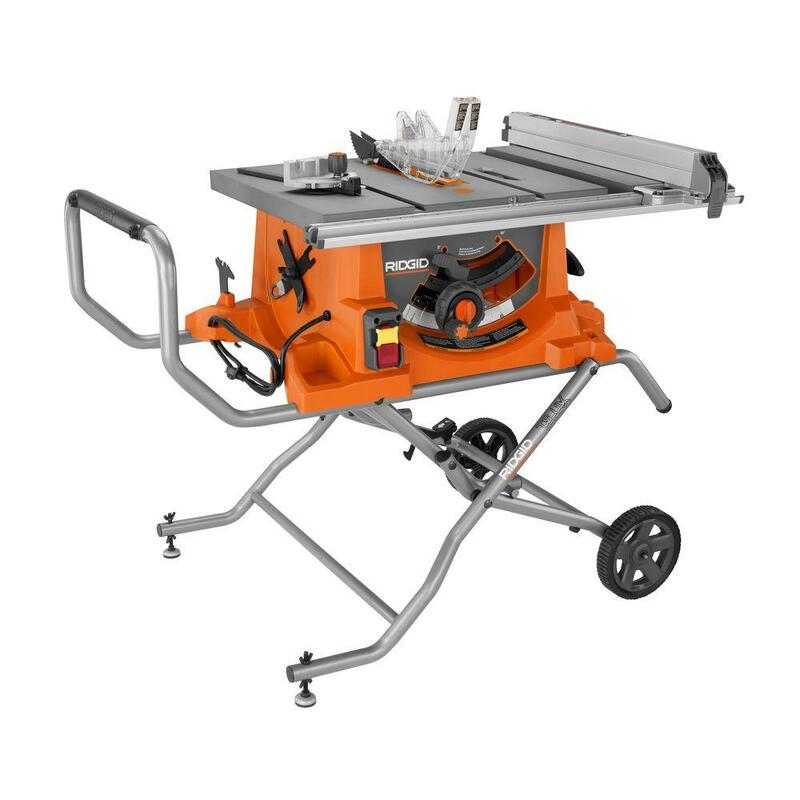 The stand is sold separately, making this a great table top saw by itself but costing more if you need it as a jobsite saw. 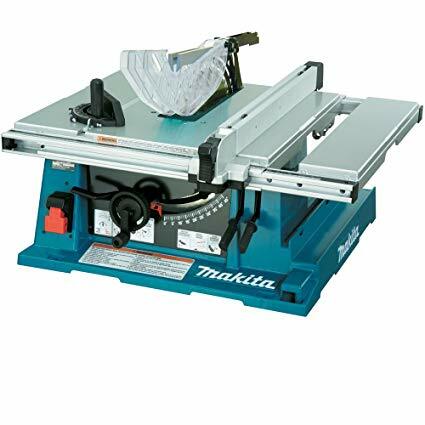 Makita makes great tools and this saw is no slacker. It can tackle those DIY chores with no problem. At under $530 for the saw without the stand, it’s a little pricey but it comes with Makita’s well-known reputation for reliability. This saw has the largest rip length at 30”! That’s about 5 inches more than most portable table saws. The push stick stores in the fence, which is a very handy and important safety feature. The Ryobi comes with a rolling stand and folds up small enough to easily store in an unused corner of your shop or garage. The 15-amp motor is powerful enough to cut through any material without bogging down. All accessories, such as the push stick and miter gauge, can be stored onboard for easy access. The legs become the handle for moving the saw, creating an awkward angle. The wheels are hard plastic and not as durable as some of the rubberized wheels on competitive saws. The rip fence can be a little bit tricky to align and should always be checked with a square before cutting in order to ensure square cuts. This is a good homeowner saw for less than $250. If you need a saw to use on occasional projects and even some longer home renovations, then this is the saw for you. It’ll cut its way through any material and is durable enough for any homeowner. The Lifetime Service Agreement gives you free parts and service when you register your saw with Ridgid within 90 days of purchase – which is pretty cool! The blade is more exposed on this saw, allowing it to cut through 4” materials. Since most portable table saws can only cut 3.5” material or smaller, this is a really nice feature when a large chop saw isn’t handy. The stand features a single point release, which makes it really easy to set up and take down. 25” rip capacity so any sheet of material can easily be cut in half. The motor spins at a ripping 5,000 rpm, giving it plenty of power for work or home jobs. The push stick and miter gauge are stored outside of the saw so they’re easy to access while working. This Ridgid portable table saw can be used with a dado blade. The same “lock-down” rip fence design that most other saws use allows for grime to build up on the rails over time, which makes the fence harder to move. The wheels and plastic pieces are not as durable as some of the other saws in this price range. 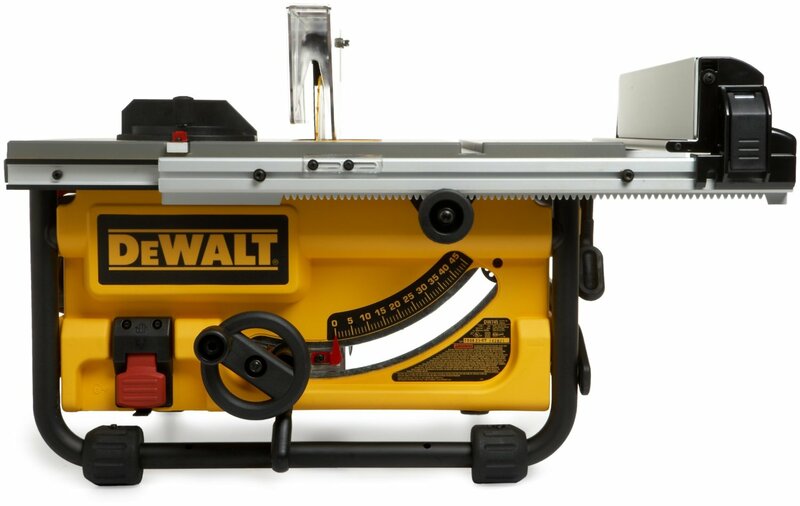 The DeWalt DW745 Portable Table Saw tops the list because of the rack and pinion fence, the easily accessed push stick, the all metal roll bar and the overall solid construction. 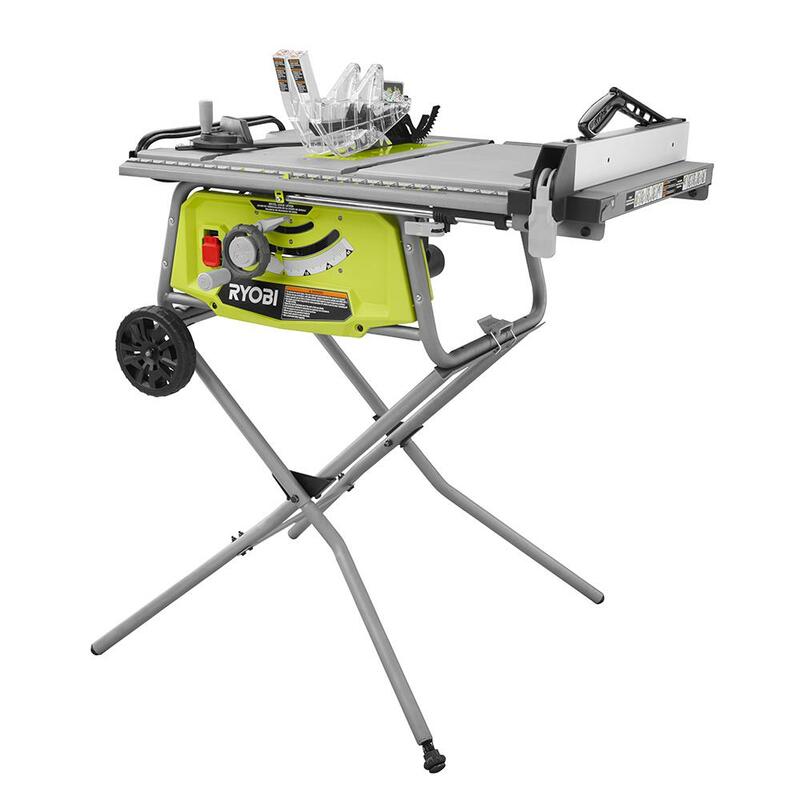 It’s also priced lower than many saws in the portable category. It cuts very true and square because the fence can’t be bumped or pushed off of square and the 15-amp motor has plenty of power. Don’t hesitate to put this one at the top your list!